Michelle Hartjes of Bespoke Packaging has been nominated for the 2016 St George Banking Group AusMumpreneur Awards. Michelle is a Mum of two teenage boys Liam 18 and Jett 15. Loves all things creative including photography, paper craft, baking and event/styling decorating. She recently won a gold award and 3rd place in the Portrait category for her photography at WPPI (Wedding Portrait Photographers International conference) in Las Vegas. Her love to travel combines well with her business, although life is busy and hectic, being organized and a prolific planner is a key attribute to her success. Ten years of management experience gives the edge needed to manage her 4 businesses, Bespoke Packaging, Bespoke Studio, Bespoke Photo Booths and most recent purchase Stamp-it Rubber stamp Co. There are many benefits to balancing business and motherhood as Michelle Hartjes explains, Lifestyle and flexibility are the main factors however a strong drive and ambition to create a great place to work also inspire me”. Read more at www.ausmumpreneur.com. 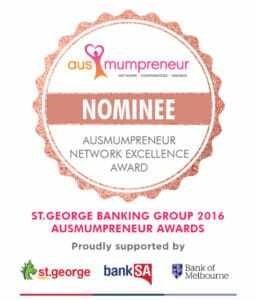 The winners of the 2016 St George Banking Group AusMumpreneur Awards will be announced at a glamorous Awards dinner at Crown Casino, Melbourne on 14 August 2016.